What signs are we speaking of? Considering the Blue is operating some runs of 5000-series with Pink Line equipment plus the fact that the Pink and Green Lines often borrow each others' cars, I actually wonder if CTA will assign a common fleet to the Blue, Pink, and Green Lines, while assigning the other series to the Red, Purple and Yellow Lines, with Brown and/or Orange getting either series. I think this could actually make sense. Pink & Green, but not Blue as well. IIRC, happy to be wrong, this current measure is essentially a stopgap until the necessary equipment and upgrades are in place. I don't see this being a long-term solution. There are common assignments now with the 5000s. 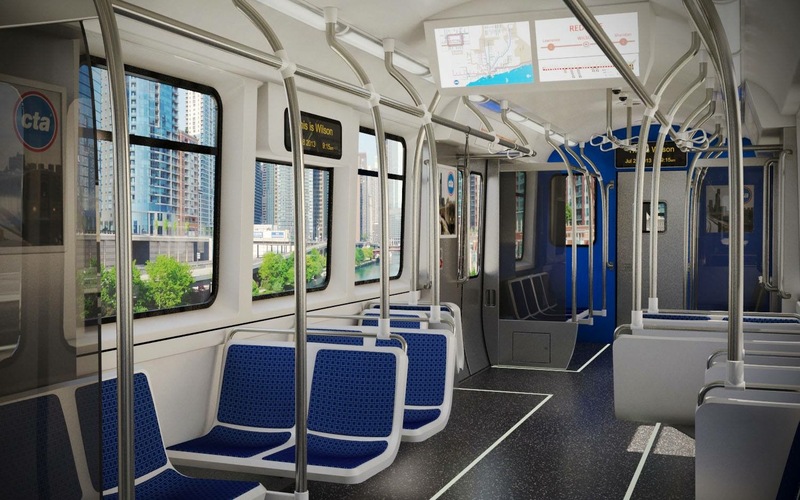 While one can't be sure about what CTA will do in the next decade, it sure looks like the Orange, Brown, and Blue will get the 7000s, and hence common equipment. As has been pointed out numerous times before, only 5000s on the Blue Line are 54th yard cars and have 54th/Pink run numbers. Steven Vance shared this image of #8011 with an new interior sign that shows alerts and next stops. The signs depicted in the photo, above. It was originally posted in the 7900 Series Nova LFS thread. They are putting something like that in the 7000s. Look at the interior sketches. 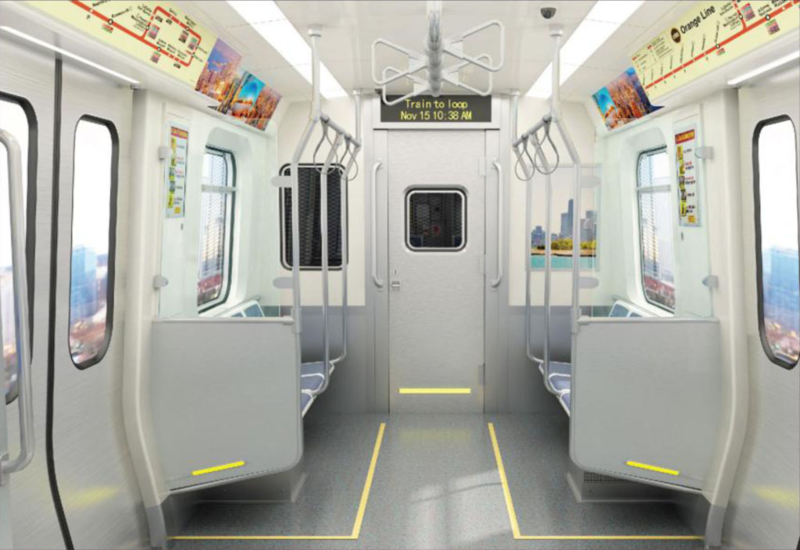 Not seeing that type of display in the renderings displayed on Chicago L .org, unless they change the ones displayed at the ends from limited-information LEDs to an LCD display. I suppose the Chicago Skyline sign displayed in the following picture could be a placeholder for something like that, but it would seem easy enough to mock up a display. Can you provide a link to the renderings that show these types of signs? Thanks they look sort of similar to what they were trying in the #J14 but better more modern. I dont know that it's so much of an experiment as it's probably a preorder. If the signs screw up then the order gets delayed. Probably then the new buses will be coming with these signs. I need to check these out and see how they function. Theres no youtube video showing the functionality?
. I suppose the Chicago Skyline sign displayed in the following picture could be a placeholder for something like that, but it would seem easy enough to mock up a display. That's it. As was noted at the time, the side windows with the destination signs do not have the punched maps in the advertising rack above them. More than likely, the "skyline" is not that, but station names written vertically. I thought the interior design was to eliminate those long sideways seats that the bums stretch out on. While the center of the car is supposed to be 1 by 2, like the 3200s, most plans for the #2 end are for 4 longitudinal seats. Some people complained at the time. So, if one assumes that the perspective is from the #2 end, it shows only 3 of the 4. IMO, a better drawing would have been from the door well. Chicago-L.org has a handful of renderings. I'm happy to see the blue walls are gone. They looked terrible. The off-white reminds me of my favorite trains - the 2200 series. Of course, they started off with a greyish interior and padded black seats but ended up with the off-white walls. I was four when they debuted and five when the Kennedy extension was opened. Still remember riding from Jefferson Park to Desplaines, back downtown, out to Cicero-Berwyn, and back to Jefferson Park. We rode the 2200's, 2000's, ad 6000's that day. Although I was in college when the Rosemont and O'Hare extensions opened, my dad and I repeated our excursion. On all three trips we sat at the front of the train. I did not, however, sit on his lap the last two times. Thanks for indulging me in this little diversion from the topic. I'll have to repeat that trip when the 7000's arrive. I'm happy to see the blue walls are gone. They looked terrible. What's so terrible about this blue wall? Looks like a little boys' toilet room. Also note that these are conceptual, as the bidders were required to provide 3 aesthetic concepts. Maybe the slide show at the CT Board meeting shown up the thread is what was selected, but nothing is final at least until the test units are delivered. To put it one way, it ain't pink, but maybe half of them should have been. As someone who loves the color, I think the blue hue looks nice. I honestly prefer those light blue walls over the creme color. I tried liking them, but can't. Not sure what it is about them. The blue makes people look like corpses. Maybe the blue needs to be a little lighter. They should have tipped the hat to the 6000's and made the walls green. 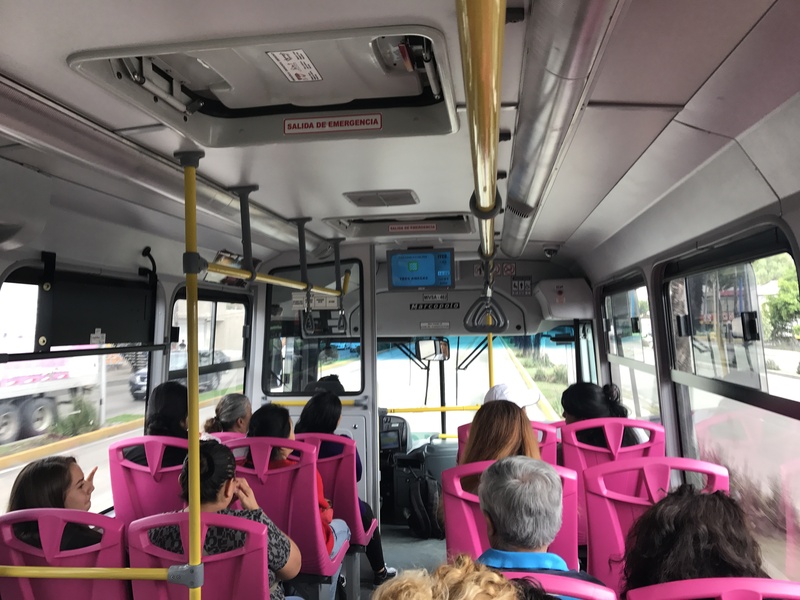 Sorry to go a bit off topic here, but coincidentally enough on the Metrobús BRT system in Mexico City, the seats on the front section of each bus are pink because they’re reserved for women. (Though this is only really enforced during rush hours, as I was able to ride in that section in the offpeak without any complaints.) Supposedly it’s to curb sexual harassment. Would CTA have been subjected to a lawsuit claiming favoritism towardBombardier? Apparently CTA was fed up with Bombardier enough that it badly wanted to choose another builder. 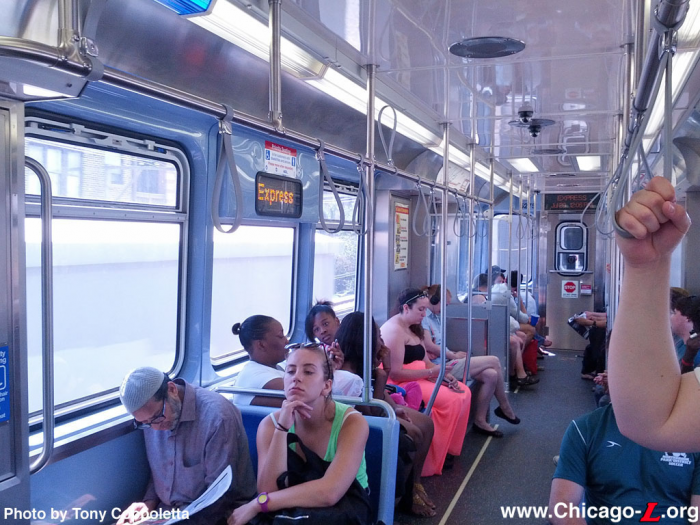 Moot speculation about CTA's motives at this point. Just as CTA pointed out that no one protested when CTA withdrew the first solicitation, it doesn't appear that anyone protested the first specification. * Either one accepts CTA's explanation that it didn't like the first set of bids or not, but at this point it doesn't matter. *As other bus builders did to the 4400s spec intended to get MAN a sole source contract. I gotta feeling we're going to be seeing the prototype for these cars soon. Have anybody heard of anything?